A greenway is a strip of undeveloped land, usually along a stream or ridgeline, which creates a continuous corridor, providing environmental, wildlife habitat, water resources benefits. Greenways serve as links between man-made features and the natural environment, which protect the natural environment, interconnect landscapes, and provide natural buffers. They can tie various park components together to form a cohesive park, recreation and open space system. Some greenways are primarily public recreational corridors, used for walking, hiking or canoeing, while others are function exclusively for environmental protection, such preserving steep slope areas, or protecting a scenic ridgeline or wildlife corridor. 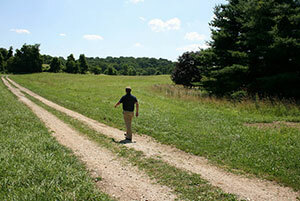 A greenway is a concept of planned development and conservation. It is a coordinated vision between many different parties that can provide recreational values and health benefits, pollution and flood mitigation, historic and scenic preservation, transportation enhancement and economic benefits. Greenway concepts are generally outlined in a municipal comprehensive plan. An analysis of need and a strategy for greenway creation are established with these plans. Specific tools to create the greenways are contained in the municipal zoning ordinance, subdivision and land development ordinance, and (if adopted by a municipality) an official map. Greenways are associated with benefits and advantages that generally fall into four categories: economic, environmental, recreational and social. Reduces vehicle use, including non-motorized commuting. Development of urban greenways can be relatively costly. In order to facilitate the implementation of a greenway system, the following general steps should be taken. Establish Policy: A municipality should adopt or amend its comprehensive plan. The plan should identify all the natural resources and recreational needs of a community and indicate the general location of proposed greenways, their type, and proposed uses. Acquisition Strategy: An acquisition strategy must be developed. This includes a determination of ownership, funding sources, types of permitted access, and costs of proposed improvements. In some instances, municipalities will develop a master plan showing which greenway links will be protected first and set design standards. Include natural feature protection standards and open space requirements in its zoning ordinance. Include trail/pathways standards, buffer requirements, mandatory dedication/fee-in-lieu, and/or sensitive siting requirements in the subdivision and land development ordinance. Adopt an Official Map which gives the municipality the time to acquire important greenway linkages before they are developed. Acquisition/Development Process: Establishing a complete network of greenways takes years to accomplish. Consistency and determination is needed to complete the vision over time. A common issue occurs regarding whether greenways should be open for public recreational uses or retained solely as nature preserves. The answer to this conflict depends on the terrain of the proposed greenway and the community's needs. Frequently, careful design can accommodate both uses. In areas where endangered species are present, the best greenway use is probably a natural preserve with no public access. In a suburban area where the greenway is based on an abandoned rail corridor, public access is more appropriate. A greenway centered on a stream corridor may have public access restricted on steep slope areas, but a walking trail may be located in the floodplain. Each situation must be considered separately based on the physical characteristics of the greenway system. Ideally, greenways are a partnership between the public and private sectors. In Chester County, county government is providing the overall vision for the concept, by promoting landscape and community vision through Landscapes2, the County's 2009 Comprehensive Plan, and Linking Landscapes, the Open Space Element of the County Comprehensive Plan, along with providing funding for local government planning and acquisition of greenways. Municipal governments are planning for local greenway links and acquiring and maintaining them through public acquisition or the development process. Non-profit conservation organizations are assisting individual landowners in preserving the important natural features on their properties. The private sector is recognizing the importance of these efforts and supporting them. Because it is a large endeavor, greenway networks can up to ten years or more to realize. Flexibility and patience are the keys to greenway creation. The most important links may not be available all at once and may need to be acquired piece by piece over time. An owner may be willing to protect a greenway as part of the development process, but not exactly according to the master plan or with some use restrictions. Greenway creation does not necessarily require the expenditure of public funds. In some cases, especially where natural feature preservation without public access is the primary purpose of the greenway, the purchase of land or easements is not required. An example is a greenway located along a floodplain. Strict standards for natural resource preservation can be established within the municipal zoning and subdivision and land development ordinance to preserve the greenway through the development process. Consideration should be provided for on-going operations and maintenance costs. West Bradford Township's Creating Connections: Country Paths & Village Sidewalks — A Greenways, Trails and Gateways Plan, a component of its Comprehensive Plan, provides for extensive greenway planning in the Township. The main purposes of greenways in West Bradford are natural feature protection, landscape buffer to development, and biodiversity enhancement. Additionally, the Township's Official Map depicts the location of proposed trail/greenway corridors. East Bradford Township (2004 Comprehensive Plan, Chapter 8 — Parks, Recreation and Open Space). 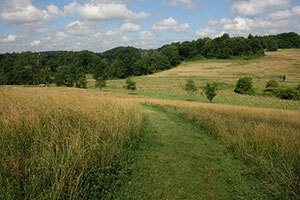 East Bradford Township's zoning map, official map, and trails and parks map are available online. Kennett Township (2004 Comprehensive Plan, Chapter 16 — Open Space and Recreation Plan). Kennett Townships maps are available online. The Pennsylvania Municipalities Planning Code (MPC) provides the legal basis for creating greenways through a Comprehensive Plan (Article III), an Official Map (Article IV), a subdivision and land development ordinance (Article V), a zoning ordinance (Article VI), and a recreation plan (Section 503.11(vi).